Tester in tester box with cap. 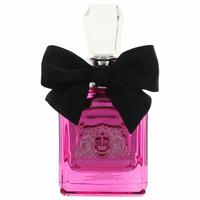 An enticing rendition of the original best-selling fragrance Viva la Juicy. A rich interpretation of the signature Viva la Juicy scent, Viva la Juicy Noir highlights the succulent ripe berry notes and gourmand accents, while adding a juicy touch of honeysuckle and a sultry hint of sandalwood. Leave a lasting impression with Viva la Juicy Noir. Top Notes: Wild Berries, Mandarin Orange.